Packed with bright tropical aromas and brilliant citrusy flavors, this unfiltered IPA wraps up with a pleasantly smooth finish. Friday night, sitting back watching my Cleveland Indians get slaughtered by Minnesota. I'll buy beer for a year for whichever team takes Kipnis off our hands. Anyway, let's get to it. Look - It's pretty much as hazy and unfiltered as the name on the bottle would imply. Murky orange without any clarity though light penetrates of course. Head is a finger or so and thick. Moderate carbonation from what I can actually see. Smell - Floral dominated with touches of random fruits here and there but the nose is surprisingly one dimensional for the most part. Beer is fresh until late July so the age shouldn't play much of a factor. Taste - Really picks up here. Lotsa naval orange and tangerine on this front. The floral aspects stick around as expected but that super fruity orange really takes the forefront and the finish is quite reminiscent of raw orange juice. Feel - Surprisingly thick for the style. Swallows smooth with a low level of carbonation. Overall - This is a pretty solid NE style IPA especially coming out of a larger brewer. And at $9.99 a sixer you have an absolute steal, though mine was part of a kroger mix a six purchased several weeks ago. Try it. Excellent tropical IPA. Pours a beautiful hazy gold. Smells and tastes fruity. Smooth, yet still has a touch of bitterness to remind you you're drinking an ipa. 7.5% is respectable. Id prefer some pine/grass in there to get it that danky effect but whatever, its a great brew. Cloudy amberish brew with plenty of foam in the big Stella Artois goblet. Pleasant sudsy mouthfeel. This smells and tastes like some kind of candy. I looked at the label again-- an IPA? Fresh wood chips and orange peel. Some canned pineapple with a splash of diswater. Not very bitter or hoppy tasting but some kind of herbal astringency lingers in the aftertaste. I had the impression New Belgium was doing a nice job with this bargain label, but I would call this one a step in the wrong direction. From the 12 oz bottle purchased at the market. A: Pours typical hazed orange color with two fingers of creamy/fluffy head. Very good retention with sporadic wet lacing. S: Weak aroma. Spices and some faint sweet fruits. Also wheat. T/M: Funky. Fruits. Spices. Zesty orange. Various fruits. Hop bitterness is on the light side of things. A little pine. Wheat. Medium bodied with just enough carbonation. The finish is semi dry with a little linger of fruits and hops. Has a Blue Moon taste. O: Pretty good beer. Nothing special. Not the best example of the style. Not worth the price (at least what I paid). Taste is a little off, but still enjoyable to drink. The beer pours a hazy orange-yellow color with a one finger head of white foam. The head faded rather fast leaving traces of spiderweb lacing behind. The nose is rich in tropical fruits of mango, pineapple, and papaya with a large showing of tangerine and lemon. The taste begins with a big hit of the fruits that are in the nose, with more snd more fruit developing throughout. All the while there is a modest hop taste of citrus and some lighter herbal and pine tastes. In the end with the increase in fruit and the moderate hop, one is left with a rather bright and sweeter juicy taste that is rather clean in profile. The body of the brew is slightly thicker which is rather nice for the fruity and slightly sweeter taste profile. Overall a pretty good beer. It was a little on the sweeter side and less hoppy side for a 7.5 % brew, but it was an easy drinker with a rather clean taste. Not too shabby. Look: Pour dark yellow in color, with cloudy/haze complexity. 3 fingers worth of frothy white head which dissipates rapidly. Loads or lacing on the glass. Smell: Juice forward, with orange, grapefruit, tangerine, mango and papaya comprising the total smell. Nice smelling, with some lemongrass hop presence. Taste: Follows the nose, with a slight gritty bready taste. Citrus fruit flavor is strong and well implemented. Some stonefruit flavoring as well. Feel: Medium in body and weight, with low carbonation. Soft and pillowy. Very nice. Overall: Very well made hazy IPA. I would have again. I am grateful to have tried this beer, and I recommend. Cheers! pours opaque yellow/orange. nice white head that fades into a nice little cap of foam and good lacing. nose is tropical fruit, citrus, hops. not a punch in the face like some NEIPA offerings, but definitely there. taste follows suit. low bitterness. ripe mango, papaya, tropical fruit, grapefruit, pineapple. lightly malty sweetness. really does taste kind of like mango/pineapple juice. mouthfeel is soft and smooth. low carbonation. lingering ripe mango. overall a surprisingly good, nationally distributed NEIPA. bottom line (now that i'm bored) is this is good, NEIPAs are stupid, brewery knows what they're doing, and i'd likely have it again. out. I'm a long time alcoholic, probably have Cirrhosis, since I tried it, this is the only beer I drink now. Can drink a whole 6 pack and don't get a hangover. wish I could give it 6/5 stars. Don't believe what other people say, this is the best beer on the PLANET!!! I created an account on this website just to rate this beer, that is how much I enjoy it. Poured into a grip shaped goblet: color is thick, hazy, almost dense gold; head presents at least 1.5 inch thick with a rounded top over the glass edge, taking minutes to lower and still leaves at least 1/4 inch top. Smell is a bit soft, light floral and citrus with pineapple. Taste follows aroma with light presence with floral, citrus, and pineapple like hop flavors, not much malt depth or notable adjuncts - spice is noticeable but not distinguishable. Mouthfeel is a softened ipa at first then the bitterness overtakes and dries out the tongue. I'm still not sure on how the hazy/NE IPA sub style should play out in terms of presence, but I don't think i prefer how this variation plays out. Overall - presentation is decent, just a bit to thick; smell is subdued; taste brings more than aroma; mouthfeel is soft and then quickly dry. 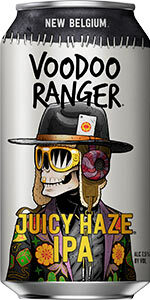 Voodoo Ranger Juicy Haze IPA has a thick, off-white head, an opaque orange-yellow appearance, which clouds up, even more, after the "swish & pour". It has heavy glass lacing. Aroma is somewhat sweet & fruity, but the overall aroma is of breakfast cereal (think Cherrios). Taste is similar, with low level pale ale bitterness. Mouthfeel is high medium, and Juicy Haze finishes medium wet. Appearance - Pours hazy and mellow orange in color with an off-white, near two-finger width head.Good retention before dissipating to a thin, consistent layer of suds with a strong thickening around the edge of the glass. Strong lacing, with thick lines and some webbing breaking down to tiny spots decorating a good portion of the glass. Smell - Orange, spice, wheaty undertone. Peach develops as it warms. Taste - Follows the nose. Orange and peach fruitiness upfront with a touch of spice and wheat riding beneath. Light earth. Sticks with the sweet peachiness through to the aftertaste. Mouthfeel - Medium-bodied with fair carbonation. Drinks easy enough with a slightly dry finish. Overall - Not good. It's like Blue Moon decided to make a hazy IPA. One of the worst NB brews I've had that I can recall. L: Cloudy, opaque golden orange with an enormous creamy white head. Long-lasting beautiful retention with sheets of lacing. S: Mango, papaya, apricot, honeydew melon, dankness, pine. Rather subdued overall, though. T: Apricot, cantaloupe, honeydew melon, mango, papaya. Soft white bread malt. Delicate stone fruit. Catty dankness and very light pine on the back end. Very minimal bitterness. F: Silky, light carbonated, smooth and soft throughout. A slight lingering stickiness resides on the palate. O: Not of the better NEIPAs, but not bad, either. Sort of the middle of the roads. Hits some marks, and not others. Voodoo Ranger Juicy Haze IPA brewed by New Belgium Brewing, with an 7.50% ABV. This American IPA pours out a nice golden amber color with a nice white head. There is also a nice amount of lacing to this brew, it sticks to the side of the glass well. The smell is rich with hop bitterness, and earthy grains and malts. You also pick up on a mild sweetness in the smell of this brew, as well. Now for the taste, it is bold with flavors. You pick up a sweet Hoppy goodness. There is alot going on in Voodoo Ranger Juicy Haze IPA. You also pick up on a nice amount of earthy grains and malts in the taste as well. Voodoo Ranger Juicy Haze IPA, has a nice smooth sweetness to that really makes this brew enjoyable. The body of this American IPA is a solid medium. There is nothing overpowering about this brew, it has a super nice balance to it. I can't get over how smooth this brew goes down, it is really hard to pick up on the 7.50% ABV in this brew. The mouth feel is Bold, Sweet, Hoppy, Clean, Smooth, and Refreshing. Overall I'm going to give Voodoo Ranger Juicy Haze IPA a 4.25 out of 5 I would definitely look this brew up again giving the opportunity to. New Belgium Brewing, did a real nice job with this American IPA.